Place chicken between two sheets plastic wrap: pound with meat mallet or heavy pan to flatten. Uncover and sprinkle evenly with salt and peppers. 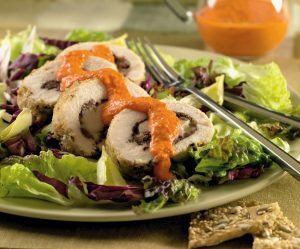 Sprinkle cheese and olives evenly onto center of each chicken breast; roll up, jellyroll-style and secure with wooden toothpicks. Dredge chicken rolls in breadcrumbs. Meanwhile, pulse red peppers in food processor until pureed; add yogurt and salt, pulshing just untilsmooth. Refrigerate until ready to serve. Remove chicken from oven and remove toothpicks. Let cool slightly. Slice; into 1-in. thick slices; arrange over salad green and serve with red bell peppers sauce.